Home » Featured » Sumo Wrestlers : Fat or Fit ? 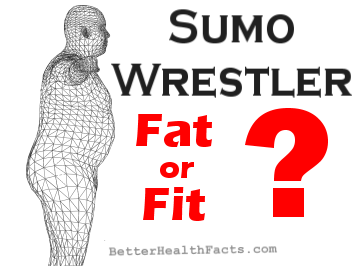 Sumo Wrestlers : Fat or Fit ? Sumo wrestlers are one of the most reputed athletes in Japan and people take blessing from them for a good health. But people from other parts of world often wonder if a Sumo Wrestler should be considered healthy of not. Their physique gives an impression of a diseased person, who has gained enormous amount of fat. But when we see them in wrestling rings, they give a tough fight to wrestlers of any other form of wrestling. Some of you must have seen sumo wrestlers in WWE. On an average a sumo wrestlers is 185cm in height and 148kg in weight. It gives us a BMI (Body Mass Index) of 43. Anything above 30 on BMI scale means that the person is suffering from Obesity, which is a disease in modern terminology and can lead to lifestyle diseases like diabetes and hypertension. Most of you must have already made their mind about health of sumo wrestler, but we will suggest you to read this article without any preconceived notion. Usually we see sumo as a wrestling sport but the truth is something beyond. We will tell you that after discussing about the health perspective. Diet of a sumo wrestler is not composed of fatty food, as usually believed, and they don't eat all over the day. They eat just two heavy diets in a day and eat Chanko Nabe (or Sumo Stew), which is a protein rich diet made with all kinds of vegetables (bok choy, mushroom, daikon, anything you can think of) in a rich dashi and chicken, fish, meatballs, tofu. Their diet is composed of 4000 to 5000 calories per day, while some wrong sources mention it as 10000 to 20000 calories (which is something inhuman). Actual sumo diet is more than twice of a normal man, but it does not increase the visceral fat. which is main cause of obesity related diseases in normal people. Unlike other seasonal sports that happen only at a part of year, Sumo Wrestling tournaments occur all over the year, so professional sumo wrestlers train themselves all over the year and eat accordingly. Some facts about training sessions of Sumo Wrestlers are listed below. Sumo Wrestlers are not allowed to have breakfast, instead they have a large lunch after training session. If we talk about their training, then it is intense and one of the toughest. Some facts about Sumo training are listed below. They are trained to do all kinds of splits. Lifting their legs as high as possible or spreading their legs and touching the floor with chest or cheek are part of their tough training. A single workout session can make them sweat in kilograms. Profession Sumo wrestlers can loose upto 5 kg of weight in a single session. Some sumo wrestlers have even died while training. They need to live in communal sumo training stables. They need to grow their hair long to form a topknot (chonmage). They should wear traditional Japanese dress when in public. A Sumo wrestler must always speak softly. Sumo Wrestler's rand decide the type and quality of their dress. They need to wear wooden sandals known as geta that make a distinctive clip-clop sound. When in stable (the training gym of sumo wrestlers), juniors wake up at the earliest and also help in daily chores like cooking, cleaning and preparing bathrooms for seniors. Ranking hierarchy is maintained in bathing and eating lunch. Junior wrestlers even wipe the senior wrestler's sweat with a towel. Only senior wrestlers get their personal room in stable, while junior wrestlers use dormitories to sleep. They should not show joy at winning or disappointment at losing. If a sumo wrestler breaks the rules then fine or suspension can be awarded to both the offending wrestler and his stablemaster. Due to such strict rules the dropout rate of new recruits is quiet high. Life of juniors is considered harsh among sumo wrestlers. But living a life of Sumo Wrestler is not about living a long life but about making it large and developing better soul inside. Due to this reason Japanese people respect Sumo Wrestlers just as if they are monks. Sumo wrestling is a part of Japanese tradition and their religion. Most of the sumo wrestlers don't end up as professionals, but they spend years at stable to prepare themselves for some other professions. They learn discipline and self control while also increasing the physical capability in handling any kind of pressure. They are not just tough from body but also from their brain. A number of sumo wrestlers have become famous chefs as they learned the cooking skills in the stables. In past few years the sumo associations have set a minimum height requirement of 173 cm (5 feet 8 inches) to be a sumo wrestlers. Now the weight gain requirement are also not as strict as past, to save the wrestlers from health consequences. What do you think about sumo wrestlers after reading this article. Please mention you views in the comment section.